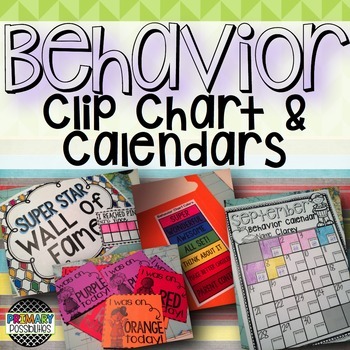 Behavior Clip Chart & Calendars! 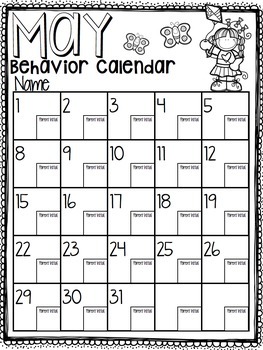 This is a super easy behavior clip chart to implement into your classroom. It can be used in multiple grade levels and includes parent involvement materials! ~Color Code: This small slip can be glued/taped into folders so that parents know what the colors on the calendar mean. ~Monthly Behavior Calendars: There are two versions for each month... pick the one you like best! Students color the square the color they ended up on that day. There is a box for parent initials. 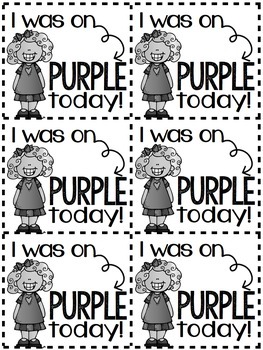 ~Daily Color Slips: These printable cards come 6 to a page and can be printed on color paper and sent home each day or only on special occasions if you choose. They are great for writing down quick notes to parents. ~Tally to 10 Pink Card: Students get a sticker or stamp each day they make it to pink! After 10 they get to put their card on the "Wall of Fame" and you can give them a small prize if you choose. ~"Super Star Wall of Fame" headers in multiple colors to go with different classroom themes.